Sunday was the enthronement ceremony of the Primate of the Ukrainian Orthodox Church, Metropolitan Epifaniy where His Beatitude Sviatoslav and Bishop Bohdan Dziurakh were present. 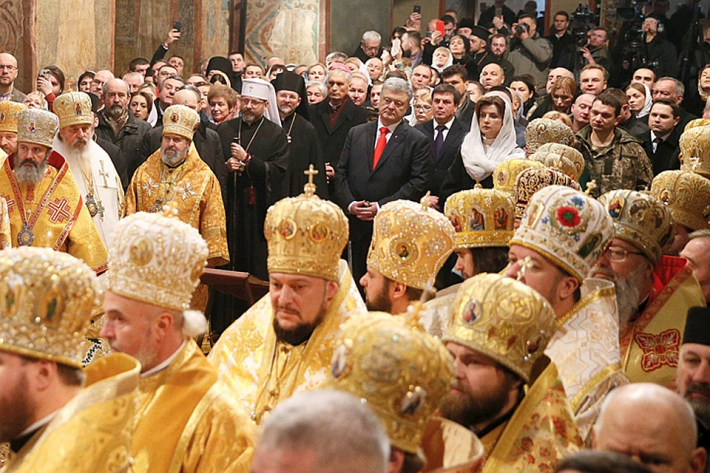 In St. Sofia Cathedral during the celebration of Divine Liturgy the enthronement ceremony of the Primate of the Ukrainian Orthodox Church, Metropolitan of Kyiv and all Ukraine Epifaniy was held. Participants in the ceremony included representatives of the Constantinople Patriarchate, and a vast number of clergy and believers. At the invitation of Metropolitan Epifaniy, which was announced during a presentation of the book by His Beatitude Sviatoslav “A dialogue heals wounds”, were representatives from UGCC, particularly His Beatitude Sviatoslav Head and Father of UGCC, Bishop Bohdan Dziurakh, Secretary of the Synod of Bishops of UGCC, Fr. Oleh Oleksa and Fr. Oleksa Petriv. “I assume that precisely in Ukraine an interesting perspective for the ecumenical dialogue in the context of new opportunities is already seen. Since between Catholic and Orthodox Churches an intensive dialogue is being held in the form of a mixed orthodox-catholic theologian commission. Our Church has already become its member. Together we can show the world that a dialogue between UGCC and OUC is achievable, whereas in Ukraine it is missing at this moment. Currently, only personal meetings and conversations in different formats are being practiced. And to start it might be a challenge for us or become the first step in our road map”. A sign of this fruitful collaboration and ecumenical dialogue became the participation of His Beatitude Sviatoslav in metropolitan Epifaniy’s enthronement and a gift of a panagia. Apart from that, Bishop Bohdan Dziurakh in his comment on this special event and his participation in the Divine Liturgy outlined: “It was a solemn and moving moment; a moment of gratitude to God; a moment of joy for our orthodox brothers and sisters and a moment of praying for His Beatitude Epifaniy so, within a given responsibility, God grants him grace of the Holy Spirit, in order to lead a flock entrusted to him on the road of God’s truth and love”. We remind our readers that on the 15th of December by the resolution of Unification council of the Orthodox churches of Ukraine Metropolitan bishop of Pereyaslavsky and Bila Tserkva, of Ukrainian Orthodox Church, Kyiv Patriarchate Epifaniy was elected a Primate of the Ukrainian Orthodox Church, Metropolitan of Kyiv and all Ukraine. On January 5, 2019 Archbishop of Constantinople and Ecumenical Patriarch Bartholomew in his residence in Istanbul signed the Tomos which proclaims autocephaly of the Orthodox Church in Ukraine.